The days are numbered to the 2011 NFL Draft as less than two weeks from today, the Carolina Panthers will be on the clock. 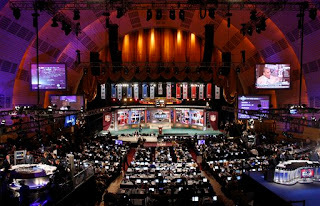 For the eighth time, here are my projections for the first round of the NFL Draft. All the indications are right now lean towards Newton going number one. Ron Rivera really likes Newton, he has no ties to Jimmy Clausen who was awful in 2010, and multiple sources (including Adam Schefter) believe that Newton will be the pick. Newton has all the tools and prodigious amounts of talent thanks to his size, arm, and athleticism. He won't be able to start right away but could be a stud down the road. The Broncos are desperate for help alongside the defensive front. They are transitioning to a 4-3 under new coach John Fox and generate no pass rush last season. Now while getting Elvis Dumervil is a major positive, the Broncos still have a shortage at defensive tackle, and that's where Dareus comes in. Dareus has an awesome combine where he had a faster 10-yard split in the 40-yard dash than Nick Fairley, despite being 30 pounds heavier. I would be stunned if he fell past Denver. Unless the Panthers select Blaine Gabbert and Cam Newton is available here, I do not think the Bills will go quarterback. Rumor has it that the organization does not love Gabbert and they may wait to take a quarterback. Meanwhile the Bills could not get any sort of pass rush last year so Miller would be a great acquisition. Miller has had an awesome pre-draft process, especially when he was on the Chan Gailey-coached team at the Senior Bowl. He has been compared to the late Derrick Thomas and if you look at the tape, it's not that crazy. The Bengals' offense needs a complete makeover and that starts by dumping Chad Ochocinco and Terrell Owens. But then they would have nothing at wide receiver, hence the Green pick. Mike Brown has refused to move Carson Palmer so one of them will have to budge. The best way to try to convince Palmer to possibly consider staying is to improve the motley crew around him and Green would certainly help do that. I'm not buying the rumors that the Cardinals are going quarterback here, it just makes no sense for Ken Whisenhunt to go in that direction. With Miller gone, the Cardinals will take the top player in the draft right here and that is Peterson. Peterson has all the tools to be a star and is considered by some to be the best cornerback prospect in a decade. In Glendale he will either push Dominque Rodgers-Cromartie to step up his game, take his job, or form a potentially badass corner tandem. The Browns will go with Jones or Robert Quinn here. I'm leaning Jones because the team has nothing around Colt McCoy and they have to find him weapons for him to build off the promise he showed in 2010. Mike Holmgren is too smart not to realize that. Jones has has a rising stock since he had a great 40-yard dash and vertical despite a fracture in his foot. The 49ers desperately need a franchise quarterback and new coach Jim Harbaugh knows that. Harbaugh turned Josh Johnson into a stud at San Diego and helped tutor Andrew Luck at Stanford so we know he has had success with developing quarterbacks. Harbaugh did try to recruit Gabbert to Stanford and Harbaugh has to realize that he has nothing in San Francisco at the quarterback position right now. The Redskins desperately need help rushing the passer as Brian Orakpo is their only pass rushing threat. Quinn falls not because of a declining stock but rather circumstance, like Fairley. He and Orakpo could be a strong pass rush tandem of the edge in Washington's 3-4 defense. The Texans are transitioning to a 3-4 defense under new defensive coordinator Wade Phillips and they need the personnel to effectively make the switch. They need another outside linebacker to rush the passer alongside Brian Cushing and if Smith is available he would make a great fit. He is a bit raw, just like Jason Pierre-Paul last year, but he is incredibly talented and is an athletic freak. Jordan has been on fire during the pre-draft process as he has been lighting it up. He was awesome at the Senior Bowl and awesome at the combine. The Vikings could use a replacement for Ray Edwards as he is a free agent and Jordan could post big sack numbers opposite Jared Allen. Now while the Vikings have nothing at quarterback, I really can't see them taking Jake Locker here, as has been rumored. The Rams really need a receiver but there is not one available that would not be a reach. One of their bigger needs is defensive tackle and Liuget has had a rising stock of late. He is versatile and is equally adapt at stopping the run and rushing the passer. He and Chris Long could make a great tandem on the Rams' defensive line for years. The Dolphins are in a tough spot because there are no guys that would fill their needs that would not be a reach at this spot. I have been mocking Mark Ingram from the get-go to Miami but he has injury concerns that are worrying a lot of teams. Plus there a solid glut of running backs that will be available in the middle rounds. One of their other pressing needs is the interior offensive line and Pouncey would be a solid addition. He is not worth a spot this high but Miami does not have much better options, unless they trade down. The Patriots need some help on their defensive line even as Ty Warren is set to return next season from injury. Watt is a strong fit for a Belichick club due to his hard-working, blue-collar nature and he looks to bring some leadership to a young and developing defense. The Chargers need an upgrade at the 3-4 end slot and Heyward would be a strong upgrade over the current situation. He projects well to play the defensive end spot in a 3-4 and don't forget that he was also lights-out during the Sugar Bowl. The Giants need an upgrade at the outside linebacker spot as Keith Bullock is too old and is a free agent. Ayers is a plus pass rusher and would be a great fit at the strongside linebacker spot in Perry Fewell's aggressive scheme. It seemed that only weeks ago that Bowers would be a lock for the top ten. Now after a disastrous Pro Day and a knee that might need microfracture surgery, his stock has dropped like a rock. The Buccaneers have a big need at defensive end and I think they would take a chance on the extremely talented Bowers. Brandon Albert is an adequate left tackle but not in any means elite. The Chiefs need an upgrade to their line and Costanzo is arguably the top tackle available. He had a very strong combine and has all the tools to be a very good left tackle. He could also force Kansas City to move Albert to guard, which is his natural position. Peyton Manning needs much better protection from his offensive line. The Colts' offensive line is crumbling and needs reinforcements. Carimi is a classic physical Big Ten tackle who should help improve the putrid Indianapolis run game and bring some nastiness to the front five. The Saints need some help inside next to Sedrick Ellis and Wilkerson would be a good fit. Wilkerson has great size and agility, he is a former basketball player, and he has good skill in rushing the passer as well as anchoring to stuff the run. He has the potential to form one of the better tackle tandems in the league with Ellis. Pete Carroll was the only coach at Washington's Pro Day and he was there to scout Locker. Yes they did spend a heavy price to acquire Charlie Whitehurst but he really has not shown the ability to be a good starting quarterback. Locker is a local boy who has a lot of talent and all the tools but he was hamstrung during his senior season by a crappy supporting cast as well as lack of accuracy. But if he is coached well, he can develop into a very good NFL quarterback and I think Carroll will take a chance on him. The Ravens need a lot of help at the cornerback spot due to the fact that they struggled defending the pass and with most of their top corners hitting free agency. Smith has a lot of talent but may scare teams away due to his character concerns. I do not think that he would scare Ozzie Newsome away. The Patriots have a big hole at guard thanks to the retirement of Stephen Neal. Now while Watkins is 26, he actually has a lot of room to grow because he has only played football for four years. He is a solid mauler who works hard and has experience at left tackle as well. Note that the Patriots may trade out of this pick. The Bears desperate need the improve their offensive line but with all of the top lineman off the board, thery will turn to their woeful secondary. Williams is the top cornerback on the board and has the size and speed to match up with the likes of Calvin Johnson and Greg Jennings. Rex Ryan's pass rush in New York would be even more effective if they had a top flight pass rusher off the edge. Houston has the talent to be a pass rushing force. He also has the experience of playing in a 3-4 and a 4-3, which could help Ryan disguise his schemes. For years, Casey Hampton has been the elite nose tackle in football. However, he will be 34 when the season starts. The Steelers would probably prefer to wait till the middle rounds to find a successor but Taylor is too good to pass up. Taylor is an athletic mountain of a man who can clog the running lanes and can bull rush the quarterback. He would help keep Hampton fresh and effective while learning the nuances of the Steelers 3-4. However, the pass rush has been stagnant at times due to the lack of another consistent rusher opposite the beastly Clay Matthews. Reed looks just like Matthews and has the relentless effort, speed, and strength that has led many to compare the two. While I think that is a little premature, Reed does have the talent to complement Matthews effectively.